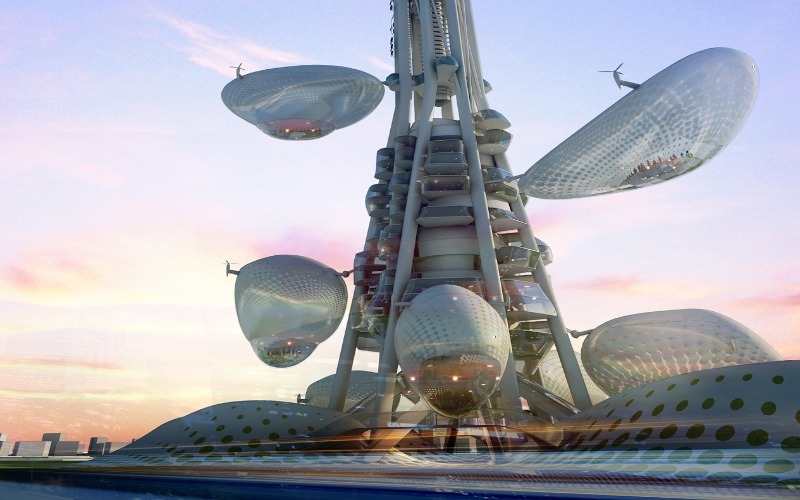 This ultra-futuristic solar skyscraper by Romanian firm Dorin Stefan Birou Arhitectura was recently crowned the winner of the Taiwan Tower Competition. The 390-meter tower is designed to serve as an observation deck, office tower, museum, and urban park. 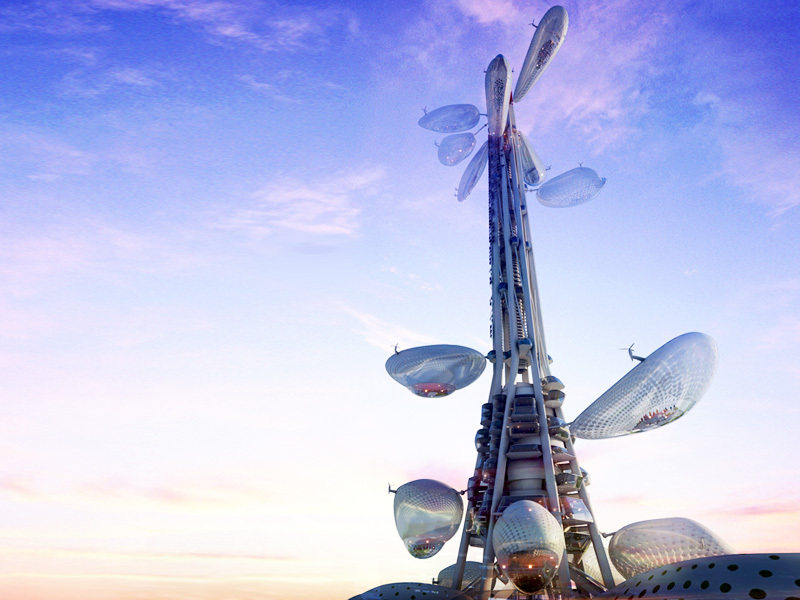 The out-of-this-world skyscraper seems almost too far-fetched to be real -- it even includes helium blimp elevators, a facade covered in photovoltaic panels, vertical axis wind turbines and a whole slew of sustainable strategies. Dorin Stefan Birou Arhitectura collaborated with Mihai Bogdan CRACIUN architect from the USA as well as upgrade.studio to design the iconic tower for Taipei. The project was inspired by the leaf, the shape of the island of Taiwan, the money tree, and other Taiwanese symbols. 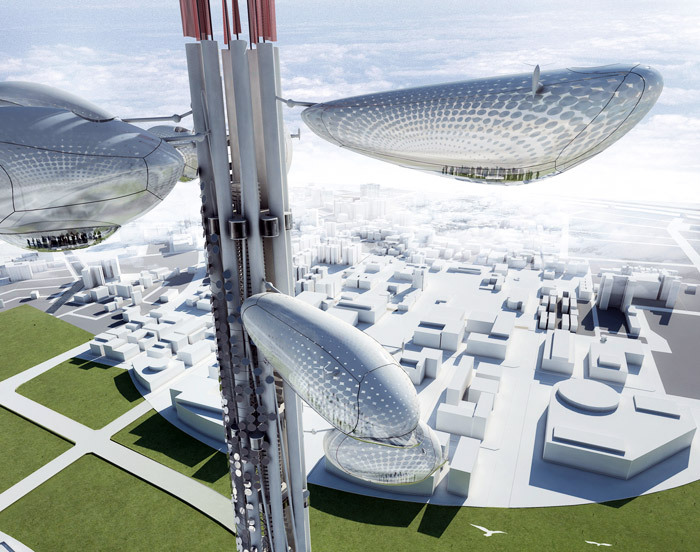 Eight zeppelin-like elevators serve as observation decks for the tower and run on a track positioned vertically in a strong electro‐magnetic field. The floating observatories will be constructed out of lightweight materials including PTFE, and the balloon is filled with helium. Each deck can carry from 50 to 80 people up to the top for stunning views of the city. The lower 85 meters of the tower provide space for a museum and offices, while the upper portion of the tower houses vertical axis wind turbines and a facade covered in photovoltaic powers for renewable energy generation. Geothermal heat pumps help reduce the energy needed to heat and cool the facility, while the small building footprint encourages cross ventilation and the tower’s height creates a stack chimney effect. Fiber optic cables bring natural light into the museum, and the photovoltaics produce energy for an electromagnetic field that provides heating for the floating observatories. Although the proposed tower does feature an impressive array of green building strategies, a small building footprint, and lots of green open space, we are very curious to see if this becomes the final design. Now that DSBA won the competition they have the chance to design the final tower, which could start construction as early as 2012. The Taiwan Tower Competition is a recent design competition that sought proposals for an iconic new tower to serve as a landmark and a symbol of Taiwan´s spirit. Over 230 proposals from 25 different countries were submitted, and the Taiwan Tower from Dorin Stefan Birou Arhitectura in Romania was selected as the winner. Inspired by science fiction, trees and leaves, the tall spire provides office and museum space in the lower third, while the upper levels serve as an observation tower. Zeppelin-like elevators serve as observation decks to carry visitors up to the top of the tower for stunning views of the city. The tower's small footprint maximizes the urban green space surrounding it. The office space and museum take up the lower levels. They have 360 degree views and operable windows to encourage cross ventilation. At the top, visitors can exit the observation elevators to a sky deck for a more relaxed view of the city below. Although very futuristic by design, the tower was inspired by trees, leaves and other traditional Taiwanese symbols. The lower levels include offices for the Taichung City Government, leisure and recreational spaces, retail and educational centers, and the new Museum of Taichung City Development. The observation elevators are constructed out of a lightweight material like PTFE that is inflated with helium. A vertical-axis wind turbine sits in the core of the tower and photovoltaic panels cover the outside to generate power. The tower also includes geothermal heat pumps to help reduce the energy demand of heating and cooling the building. The 390 meter-tall structure is designed to stand tall above the city and provide a destination for both residents and visitors of Taipei.